At school one day my son became very excited to show me something. We were outside the building and he told me it was something he made. I was confused. Then he led me to a tree and showed me a re-purposed citrus mesh bag filled with yarn scraps. He explained that it was for birds to use for their nests and said he really liked doing something nice to help the birds. Isn’t he sweet? Then I found this adorable Etsy listing that reminded me that my boys and I want to help our little bird friends find nesting materials and beautify our neighborhood bird nests, but we never actually hung one in our yard. 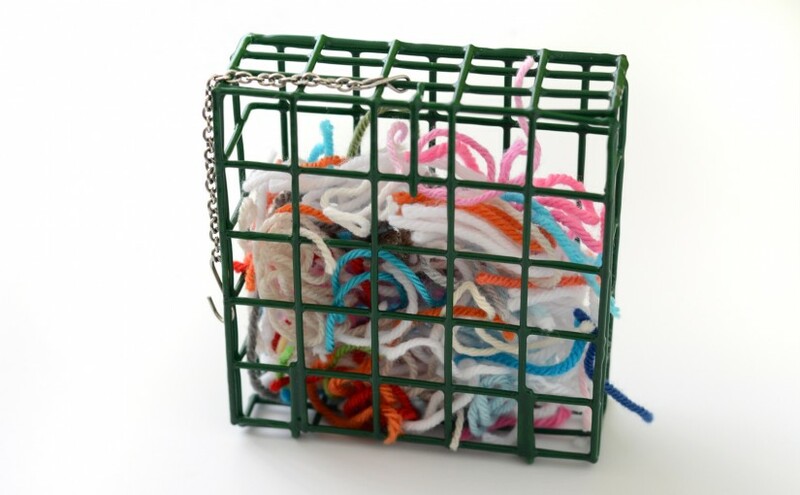 Instead, she gave me this suet cage as a thoughtful Christmas crochet-buddy gift! So now that spring is officially here it seems a little like I should have more scraps saved than this. Dare I say I have been a crochet slacker? If you would like to do this too just make sure your ends are between 4 and 8 inches long. Sarah from Repeat Crafter Me made a variation on this too. It looks like she does a LOT more crocheting than me! Ha! I love her patterns and have made several of them, but WOW! I can’t even imagine how she gets that much crocheting finished. Plus she is creating the patterns! That is talent. Check out her yarn scrap recycling post here. Previous Previous post: Welcome OYS Friends!